It is the ONLY jack recommended for you to use on your Elise. The only problem you may encounter is that the jack may be too big to fit under the car, so look for a 'low' trolley jack or failing that drive your Elise onto a block of wood, this should raise the car just enough so you can get the jack under. 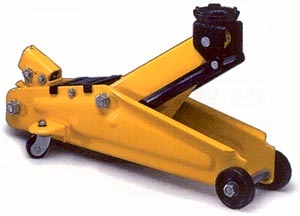 The following trolley jacks are used by SELOC members on their Elises, so unless your car is lowered significantly (most have approx 130mm ground clearance), they should fit under your Elise too. If in doubt, always measure and check before you buy. Saddle Height Min - ? Saddle Height Max - ? From - Lidl - If you need a super cheap one, check Lidl, they occasionally have some in. Check the Saddle height before you buy though. This page was last modified on 18 August 2009, at 19:26.